LG G Flex 2 review | Android review | What Hi-Fi? LG likes curves. That much is clear just from looking at some of its TVs. But those curves extend to smartphones too. The LG G Flex 2 is the company’s second crack at a curved smartphone and, thanks to better ergonomics and a sharper screen, it is a vast improvement over the original. There is a reason for that curve, and it’s not what you might think. It is lovely to handle, fitting into your hand more naturally than a flat slab of the same size. It will hug your derrière when you put it in your back pocket, and the side of your face during phone calls. And if you do happen to drop the device, the curve keeps it from landing flat on its screen. However, that’s about it. LG happily dismiss suggestions that it has any visual benefits, and it’s nothing to do with eye ergonomics or other buzzwords either. Essentially, it’s a gentle bend that makes little real difference in everyday use. The focus here is on the user experience, rather than chasing specs and competing with the flagship models. We’ve been here before, with LG’s original G Flex. That was a monster of a phone with a 6in screen, which some found difficult to use regardless of the curve. The G Flex 2’s 5.5in screen means a smaller footprint. A gentler curve also helps make the G Flex 2 sleeker and more manageable than its predecessor. On the subject of the screen, we’re pleased to see LG has got rid of the original G Flex’s 720p screen. Now it’s Full HD 1080p, the picture is noticeably crisper than before. However, it’s still not up there with the Quad HD (2560x1440) display of the LG G3 and Samsung Galaxy S6 Edge. It’s sharp enough most of the time and images are well defined, with no jagged edges. We certainly never felt like we were missing out. The OLED panel offers much stronger contrast than smartphones with LCD screens. Dark scenes go properly black, and colours are strong. But it’s not the subtlest picture when it comes to details in dark areas. Whites are also not quite as brilliant as we’d like. The standard palette is on the bold side of realistic, but you can tweak that by changing the picture mode. Use ‘Vivid’ if you want to sear your retinas, or for bright outdoor use, but we preferred the colours of ‘Natural’ mode. There are some issues: the screen doesn’t go dim enough – even the lowest setting is quite bright, which is not ideal for bedtime viewing. We also noticed an occasional bit of graininess. The G Flex 2 is capable of playing back high-resolution files up to 24bit/192kHz. It’s a clear, balanced sound, neither harsh nor overly weighty, and there’s a good amount of detail. Clear textures and leading edges make instruments easy to identify. 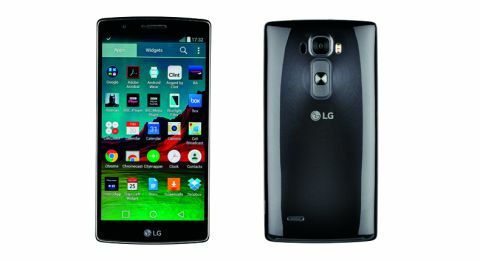 In the past, LG phones tended to lack excitement, but this has been addressed. There’s a decent amount of energy, although it’s still not quite as agile and entertaining as we’d like. In comparison, the Sony Xperia Z3 offers more precision, making for a more exciting listen. Build quality is very good on the whole. The phone feels solid despite its removable plastic back. Yes, it’s plastic, but it looks very smart in metallic silver (with a red option to come) and attracted plenty of compliments. It doesn’t feel tacky either. The G Flex 2 also has a good degree of elasticity. It’s not flexible, as the name might suggest, but you can put it face down on a table and push it flat. While that’s a little extreme, it means you could conceivably sit on it without incident. The other party trick is the unique self-healing polymer on the back of the device. On the original G Flex, the healing process took minutes. Scratches now disappear in 10 seconds, but it’s only designed to withstand normal wear and tear. Light scratches are fine as long as they don’t penetrate the self-healing coating, but don’t go digging at it with your keys. However, even after a week of careful use we found irreparable scuffs on the back. It seems the self-healing needs a lot more work before it can be something to boast about. There’s more to boast about when it comes to features. There’s also a microSD card slot for cards up to 2TB. And out of the box, it runs Android 5.0 Lollipop. That means you have the option to interact with notifications directly from the lock screen, without having to open up the appropriate app separately. It’s a cleaner and more intuitive interface than before. There’s also an effective Battery Saver mode, which comes in handy when you’re running out of juice. You may not need it often – with normal use we managed to get a day and a half out of one charge. The 3000mAh battery, sadly non-removable, has a Fast Charge feature that goes up to 50 per cent in 40 minutes. LG’s own software tricks include Glance View, which lets you swipe from the top to peek at crucial information without turning the screen on full. There is also an advanced Knock Code, which lets you unlock the phone by tapping on certain points of the screen, without the need for a lock screen. The camera has been taken from the LG G3, and that’s a good thing. The 13MP sensor is aided by a laser, which makes for superfast and accurate focusing. Optical image stabilisation, meanwhile, plays nicely with shaky hands. You get sharp pictures and accurate tones in light and dark conditions, although in the dark the LG needs more thinking time. The LG G Flex 2 features a 2Ghz 64-bit octa-core Qualcomm Snapdragon 810 processor. This is supported by 2GB of ram and either 16 or 32GB of storage. It sounds speedy – and it is. At its best, the operation is slicker than John Travolta in Grease. You can open menus and apps and bounce between them with no hint of stutter. That is, until things warm up a bit. The device is fast when fresh, but after a while it slows down a little. On a few occasions, it took a good 10 seconds to load up our video gallery. This can be helped by clearing unused apps and freeing up some memory, but it’s hardly ideal. Thankfully, this is quite rare and day-to-day operation is just fine. We have mixed feelings about the LG G Flex 2. When it’s good, it’s great. But the user experience is let down by a few hiccups, which keep the device from being on the same tier as flagship smartphones. This is a good choice if you want a powerful device that stands out from the crowd. But if you’re after a multimedia beast that ticks all the boxes, there are better options.